What are Muscle Strain Injuries of the Hip? Your body is a complex system of muscles, bones, ligaments, and tendons. All of these elements work together to create pain-free movement, so when one gets injured, it can be painful. Muscle strain in the hip occurs when a muscle in the hip joint is pushed past its limit. Strain can cause the fibers in the muscles to stretch, or worst case, can cause a muscle tear. Muscle strains are graded according to severity, from a mild and relatively quick healing grade 1 strain to a grade 3 strain, which is a complete muscle tear. What causes Muscle Strain Injuries of the Hip? Strain can occur if the muscle is suddenly presented with a heavy load or is stretched beyond its normal ability. Hip strain may be caused by overuse, like from repetitive use of the hip muscles in athletic activities. This condition can also be caused by trauma. If muscles are tight but not warmed up or if muscles are not conditioned well, strain or tearing is a risk. Symptoms of hip muscle strain may vary depending on the strain's severity and location. Symptoms generally include pain at rest or when the muscle is used, weakness or inability to use the muscle. Your pain may feel worse when the muscle is being used. Your doctor will give you a physical examination to determine the extent of the tear. 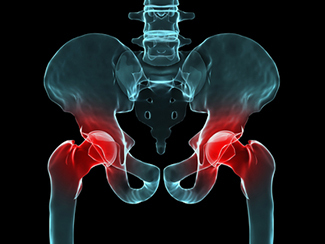 How are Muscle Strain Injuries of the Hip Treated? Treatment depends on the severity and location of the injury. Nonsurgical treatment options generally begin with rest, ice, compression, and elevation, or RICE. Your doctor may prescribe anti-inflammatory medication and physical therapy. If conservative treatments do not treat the problem or if the injury is severe, your doctor may consider surgery. The procedure performed depends on the location and severity of the tear. Regardless of what procedure is performed, rehabilitation will require physical therapy and dedication to stretching and strengthening exercises. Recovery time will vary depending not only on the injury's severity, but also on the patient's adherence to any prescribed physical therapy exercises.